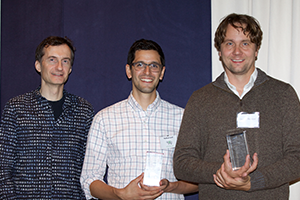 The annual MCB awards were presented on September 11 and 12 to eight MCB researchers who have demonstrated excellence in various fields. This year’s Peralta Fund Award was presented to third year graduate student Jenelle Wallace from the Murthy and Stevens laboratories for her qualifying exam proposal “Synaptic refinement in adult-born granule cells of the olfactory bulb during circuit integration.” Jenelle’s ambitious proposal (which merged important questions and concepts from both labs), her talent for scientific reasoning, and her ability to integrate multiple fields of study during her defense greatly impressed the faculty committee. James Lee (Dan Kahne’s lab) won this year’s Meselson Prize for his work investigating transmembrane protein folding. James showed that he can use a mutant to slow the folding process and thereby trap an intermediate structure in the folding pathway and study its interactions with other proteins in the insertion pathway. These achievements will eventually enable the elucidation of a step-wise protein folding pathway for this transmembrane protein.